Fr. Neil Kookoothe has developed a website that looks at the history, current situation, individuals on death row and how we can help. 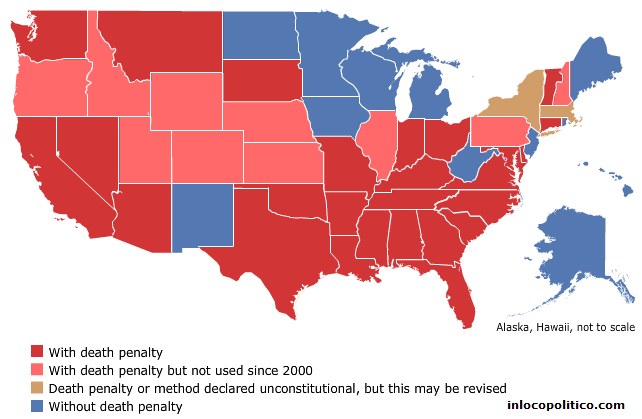 The site gives lots of detail on the current situation of death row in Ohio. This is the official website of Sister Prejean, who wrote “Dead Man Walking” about her experience being the spiritual advisor of a death row inmate. Today, she educates the public about the death penalty by lecturing, organizing and writing. As the founder of "Survive," a victim’s advocacy group in New Orleans, she continues to counsel not only inmates on death row, but the families of murder victims, as well. Pax Christi USA strives to create a world that reflects the Peace of Christ by exploring, articulating, and witnessing to the call of Christian nonviolence. The Ohio prison inmates listed below have been sentenced to death for convictions of aggravated murder and have execution dates. There are currently 138 males and one female on Ohio's ​death row. Scheduled execution on September 12, 2019 for the death of Richard Myers on March 20, 1992. He had previously been scheduled for execution on February 13, 2019 - March 14, 2018 - February 13, 2018 - June 22, 2016 - July 15, 2015 and January 7, 2015. Scheduled execution on October 17, 2019 for the death of Antwan Gilliam on March 29th, 1997. Previously scheduled execution dates: June 27, 2018 - May 18, 2016 and September 17, 2015. Scheduled execution on November 13, 2019 for the death of Leneshia Williams on January 3, 2002. Previously scheduled execution dates: May 29, 2019 - September 13, 2018, July 20, 2016 - November 17, 2015. Scheduled execution on December 11, 2019 for the death of Peter Copas on August 22, 1997. He was in prison serving a life sentence for the death of Edward V. Tucker and attempted aggravated murder of Harvey W. Blitz. Scheduled execution on January 16, 2020 for the deaths of Antonio Hunter and Terrance Walker on March 25, 1997. Previously scheduled execution dates: July 10, 2019 - September 21, 2016 and January 21, 2016. Scheduled execution on February 12, 2020 for the death of Robert Bunner on November 28, 1986. Previously scheduled execution date: April 11, 2018 - October 18, 2017. Scheduled execution on March 12, 2020 for the death of John McGrath on July 23, 1986. Previously scheduled execution dates: August 14, 2019 - April 20, 2016 - May 14, 2015 - November 19, 2014 - March 19, 2014 - April 27, 2004, and August 27, 2002. Scheduled execution on April 16, 2020 for the death of Mary Jane Stout on May 21, 1984. Previously scheduled execution date: November 14, 2018 - January 3, 2018 - January 15, 1985. Scheduled for execution on June 17, 2020 for the death of Tryna Middleton on September 21, 1984. Previously scheduled execution date: September 15, 2009 - October 24, 1985. Scheduled execution on August 12, 2020 for the death of Samar El-Okdi on January 3, 1997. Previously scheduled execution date: September 18, 2019 - March 14, 2018. Scheduled execution on October 14, 2020 for the death of Dorothea Hayes and Shenay (12yr) on June 7, 2001; and Elton "Arybie"Rose on June 8, 2001. Previously scheduled execution date: May 30, 2018. Scheduled execution on April 21, 2021 for the death of Rhoda Nathan on September 3, 1994. Previously scheduled execution date: January 9, 2019 - September 3, 1997. Scheduled execution on June 23, 2021 for the death of Christopher Hammer on September 22, 1993. Previously scheduled execution date: March 20, 2019. Scheduled execution on August 11, 2021 for the death of Christopher Hammer on September 22, 1993. Previously scheduled execution date: May 29, 2019.. Scheduled execution on October 20, 2021 for the death of Mary Stevenson on March 02, 2004. Previously scheduled execution date: October 17, 2019. Scheduled execution on December 9, 2021 for the death of Harold White, Sr.​ ​on September 19, 1985. Previously scheduled execution date: February 12, 2020. Scheduled execution on February 16, 2022 for the deaths of Esther and Ashley Cook on October 11, 1999. Scheduled execution on April 21, 2022 for the death of Jiyen Dent, Jr. on March 24, 2003.
murder Samuel Simmons Jr. on September 16, 1985. Scheduled execution on August 24, 2022 for the death of Frances Messinger on April 6, 1992. Scheduled execution on January 12, 2023 for the deaths of Ivory Fraanklin, Ophelia Franklin, and Anthony Franklin on April 18, 1997. Scheduled execution on Date Removed for the death of Amber Garrett on November 24, 1991. Previously scheduled execution dates: April 17, 2019 - September 13, 2017 - November 16, 2016 - January 21, 2015 and May 14, 2015. 2005. Previously scheduled execution date: October 23, 2019. Scheduled execution on Date Removed for the deaths of Candace & Donald Schneider in August, 2010. Previously scheduled execution date: January 15, 2020. Scheduled execution on Date Removed for the death of Matthew Dugan on August 13, 2008. Previously scheduled execution date: March 11, 2020. ​ 2010. Previously scheduled execution date: May 13, 2020. Scheduled execution on Date Removed for the death of Robert Fingerhut on December 11, 2001. Previously scheduled execution date: July 15, 2020. ​ Webb, Kim Yvette Smith, Diane Turner. Previously scheduled execution date: November 18, 2020. Scheduled execution on Date Removed for the death of Ernest “Ernie” Thomas and Erica Singleton on December 15, 2011. Previously scheduled execution date: January 20, 2021 - March 03, 2014. Scheduled execution on Date Removed for the death of Frank Munz on June 03, 2010. Previously scheduled execution date: March 24, 2021 - June 03, 2014.
scheduled execution date: April, 2010. Scheduled execution on May 17, 2017 for the death of Lawrence Sanders on February 24, 2003. Previously scheduled execution date: June 24, 2004. ​ and Sha’Railyn Wright (3yrs) on June 1, 2009. Previously scheduled execution date: July 1, 2010. Scheduled execution on April 11, 2018 for the deaths of Debra Ogle and Cynthia Tincher on March 8, 1986. Previously scheduled execution dates: January 3, 2018 - October 18, 2017 - June 13, 2017 - August 15, 2016 - September 17,2015 and August 6, 2014. OH Governor John Kasich has followed the recommendation of the Ohio Parole Board and granted clemency to William Montgomery after 28 years on death row. Scheduled execution on October 17, 2018 for the deaths of Judith Sue Crawford and Fred Hicks on November 6, 1997. Previously scheduled execution dates: February 13, 2018 -October 18, 2017 - July 26, 2017 - February 15, 2017 - February 19, 2016 - March 12, 2015 and October 14, 2014. The Republican governor (John Kasich) commuted the sentence of condemned killer Raymond Tibbetts to life without the possibility of parole, citing “fundamental slows” in the man’s sentencing.